Dr. Surbhi Gupta has obtained her MBBS from Maharshi Dayanand University, Rohtak. She later obtained her PG – (M.D Pathology) from the same institution. Dr. Surbhi was additionally awarded training certificate in Training Medical Laboratories Quality Management System and Internal Audit – IS/ISO 15189. Dr. Surbhi has over 9 years of professional experience. She started her journey as a Post Graduate Student in Pathology from Post Graduate Institute of Medical Sciences, Rohtak. She gained 3 years’ experience there before joining the Department of Pathology at PGIMS, Rohtak as a Demonstrator (Pathology). She spent 1 year at PGIMS in the Department of Pathology before joining the Department of Oncopathology, Delhi State Cancer Institute, New Delhi as a Senior Resident. She gained 5 years’ experience before joining NMC Healthcare. 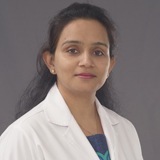 Dr. Surbhi has attended many CME’s, conferences and workshops since 2005. She also has research work and publications under her belt. Dr. Surbhi is fluent in English and Hindi.